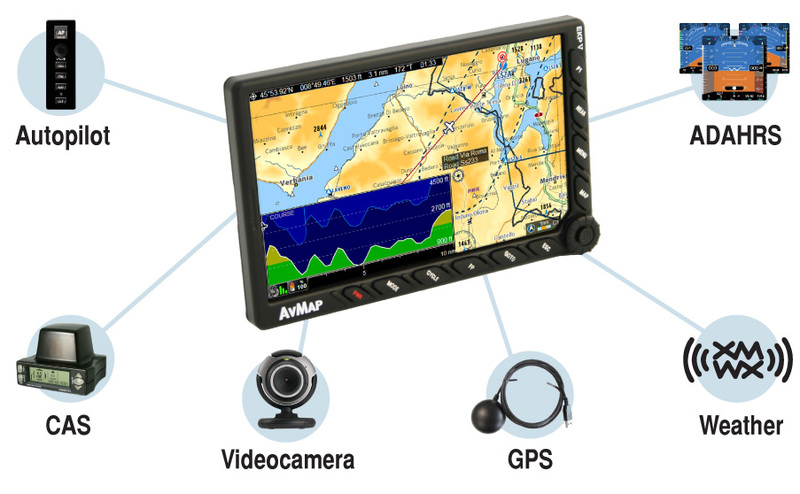 The EKP V Cockpit Docking Station allows the installation of AvMap EKP V Aeronautical Navigator into the cockpit panel, and enables the unit to interface to multiple external devices at the same time. The Cockpit Docking Station includes 4 USB ports, 2 serial ports, Audio video input (NTSC and PAL) , Audio output. The external GPS antenna is included in the box. When docked, the EKP V is powered/charged by the aircraft electrical system through a socket vibration proof for power supply AVG 16. One of the USB ports is powered by the EKP V internal battery to ensure functionality even in case of aircraft electrical power failure. Basic panel integration with the Cockpit Cradle Kit: featuring connection to Power and GPS receiver. Advanced connectivity with the Cockpit Docking Station featuring 4 USB connection, 2 serial connections, audio input and output, video input. The two models have the same size ( 164,4 x 106,8 mm cut in the panel is required), while external frame measures 172 x 110 mm.